When LinkedIn rolled out their skill endorsement programme my immediate reaction was not positive. My inner voice said “Tacky, superficial, transactional. Tapping into the worst aspects of social media interaction and white noise, akin to Facebook “likes” and Twitter Follow Fridays. There was no way to quantify the scope or quality of any endorsement and it all seemed like a silly popularity contest. They are no substitute for a detailed and thought out Recommendation from a colleague or superior, who actually knows the work of the person involved and can genuinely reference that particular quality. It’s hard to know why LinkedIn followed this trend. I can only assume that advertising revenue is correlated to member engagement and page views. This is one way of generating inter-connectivity via the alerts which appear on your LinkedIn dashboard, in your updates and as an email. The other is that apparently as many as 60% of profiles on LinkedIn are incomplete, making it difficult for recruiters to tap into profiles via keyword searches. By allocating keywords to each other, we very obligingly save the individual work and provide the LinkedIn algorithms with the necessary keyworded skills on his or her behalf. So this seems to be a way of improving results for recruiters, thus making LinkedIn more attractive and by extension enhancing their revenue stream. The danger is that we can endorse skills provided conveniently in the pop up window which may not be skills that the person actually has. I am regularly endorsed for very peripheral skills and even activities in which I don’t specialise. I can only assume that someone has clicked the yellow endorse button, which covers all skills, rather than deleting the spurious skill which I don’t have. However, despite this, I do confess to being something of a convert. I have not done a complete 360°, but certainly a bit of an about turn. Definitely a 180°! Although not as strong as a recommendation, a LinkedIn endorsement is a way for a person to acknowledge a small courtesy or service. I have received endorsements from individuals whose path I have crossed years ago, perhaps in some minor way. It’s a way of saying thank you and showing appreciation. It can be a form of networking and staying in touch. It’s a quick and easy way to let someone know you have been on their radar with a bonus of public recognition, rather than just an email. It’s a way of leaving a digital footprint in your network while eliminating the nuisance factor. It can be a way of acknowledging skills the individuals themselves don’t recognise or perhaps they don’t even understand they have. It is really useful for introverts to have that done for them, or those starting out on the online profile path. I’ve just endorsed the deserving members of my MBA Career Management workshop for leadership, team playing and engagement. All important factors in contributing to the success of my sessions. We can manage our endorsements – we have full control over which skills are endorsed and which endorsers are visible on our profiles. If specific skills are targeted or even if the preference is to have endorsements hidden, this is our choice. We can leave key influencers in our networks visible. Endorsements provide an opportunity to strengthen relationships, not by automatic reciprocation but via the initiation of dialogue. We don’t have to approve endorsements from people we don’t know. We don’t have to reciprocate if the endorsement is not genuine. So it seems provided that we all behave sensibly, genuinely and with integrity there is no reason why the endorsement system can’t provide some added value. Like with many other processes, it’s the responsibility of the user not to become the abuser. 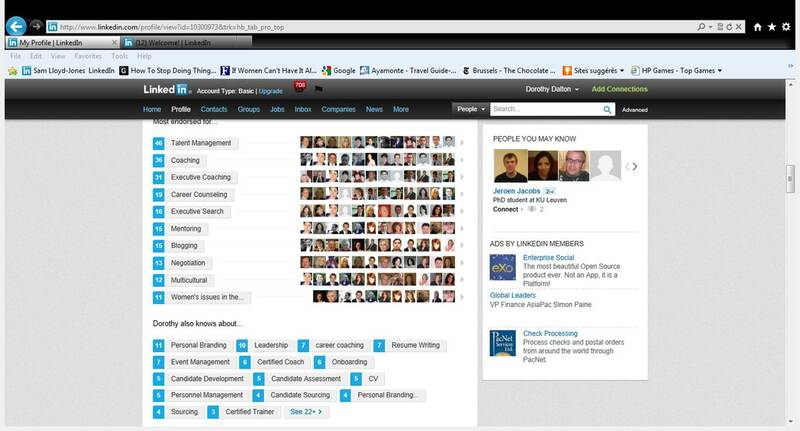 How do you use LinkedIn endorsements to enhance your online presence?